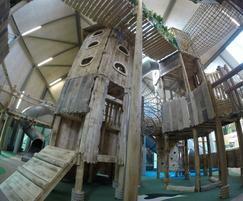 One of eibe’s most imaginative play projects is in the picturesque Wensum Valley, located in the heart of Norfolk. Pensthorpe Natural Park is an award-winning attraction, with beautiful gardens, wildlife and a indoor adventure play area. The £290,000 “Hootz House” scheme was an innovative concept, designed to bring the outside, and the world of nature, indoors. 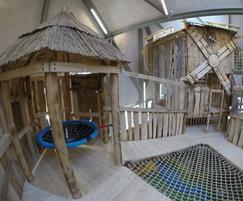 The huge barn is crammed full of robinia play equipment, offering a world of play amidst natural looking timber. Cosmetically beautiful, the new addition is sure to increase Pensthorpe’s burgeoning reputation as one of the country’s leading leisure destinations. If the Open Day was anything to go by, children can be entertained for many hours when they visit Fakenham’s finest. Consultant David Chidlow met with Pensthorpe owners, Bill and Deb Jordan. The whole ideal of bringing nature indoors was one that eibe could relate to and immediately looked at product ideas and cosmetic designs. 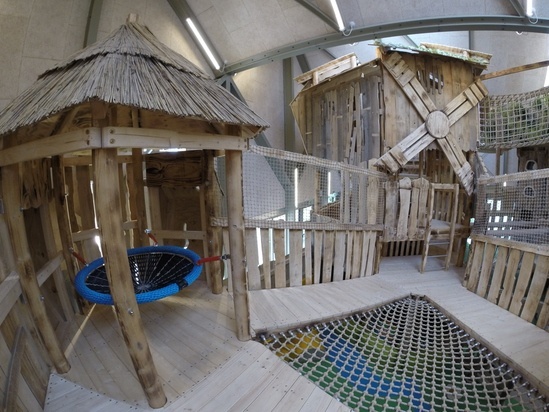 Working alongside Drew Payne and Mark Noble, Project Manager and Commercial Manager respectively, the tagline of “Adventure Play, Nature’s Way” started to formulate. A trip organised by Design Director, David Hibberd, to one of the European indoor centres at Burger Zoo in Holland gave further food for thought in terms of impact and utilisation of space. 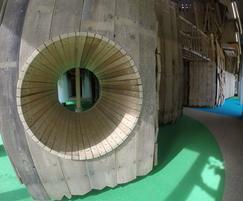 “Our clients got to see first-hand how we can design and build a magnificent indoor adventure playground. It was a privilege to work on such a fantastic scheme from the outset. From a design perspective, we had to ensure the equipment was not only tailor-made, but aesthetically pleasing and entirely new,” said David. Manufacturing of the entirely bespoke kit began over a festive period. After some initial delays with the actual building work, installation was started. eibe involved some of the German agents from Kletterparadies to help complete the build, which ultimately took around six to seven weeks. Wetpour was added which entailed a further week and a half, but since then the client has been testing the units with various school trips. All went well and the eibe team were delighted to be at the official opening.